Bach – Conceived by Madeleine Easton, Bach Akademie Australia is Australia’s only ensemble dedicated to the works of J.S.Bach. We wish to solidify our reputation as the epitome of authentic high quality exponents of J.S Bach’s music. Akademie – Bach Akademie Australia is working with Australian academic institutions such as the Australian National Academy of Music, Sydney University and the University of Melbourne to establish educational and learning opportunities for young musicians. Australia – The brainchild of Australian violinist Madeleine Easton, Bach Akademie Australia’s focus on mastery of performance, authenticity and originality of interpretation brings J.S. 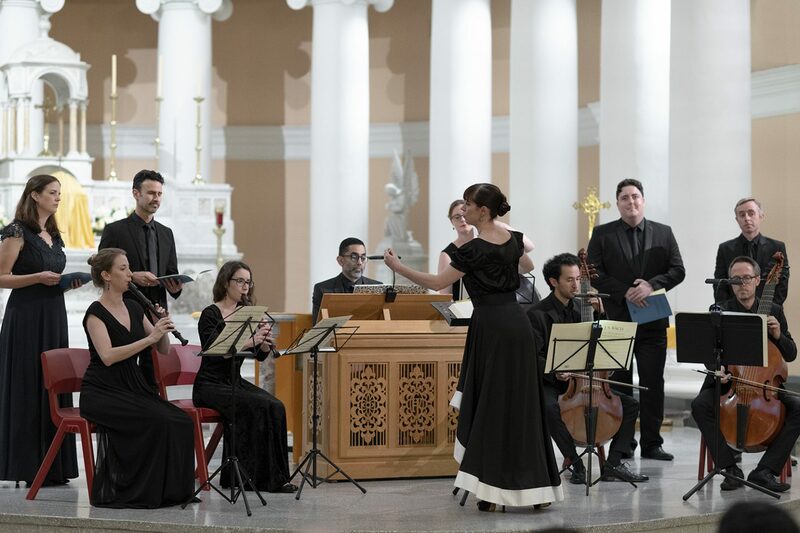 Bach to life for Australian audiences. We are raising funds for the launch of our 2019 season. We wish to build on the success of our 2017/18 seasons with programs of much greater ambition, size and scope. For this to become reality, we need to raise significant funds for the many costs of running and touring an orchestra. Bach Akademie Australia exists to showcase the music of J.S. Bach. With direct access to the world’s leading Bach exponents and the patronage of Sir John Eliot Gardiner, Bach Akademie Australia gives Australian audiences the very best experience of J.S. Bach’s music. With ambitions well beyond the shores of Australia, Madeleine Easton aims to put Australia on the international map as a place of excellence in the performance of J.S Bach. Help us to make this happen by donating to our project, and help Bach Akademie Australia grow into one of the world’s most recognised leading early music ensembles. We are seeking donations to help launch our 2019 season. The costs are many and varied but include paying for rehearsal venues, musicians fees, venue hire, administration of the ensemble, and travel and accommodation for artists. We are seeking further help to solidify our growing reputation in 2019. You will be contributing to a unique and authentic presence in the Australian music scene and ultimately expanding Australia’s contribution to global culture. Donations will be used to help to provide an administrative base for the orchestra, fund travel and accommodation for interstate and international artists, venue hire, music hire and purchase, and marketing. With the help of our supporters’ donations, 2019 will be the year that we expand, creating a subscription season in Sydney, concerts in regional NSW, and for the first time, interstate in Adelaide and Melbourne. We aim to raise enough funds by February 2019 to make our dreams of launching our 2019 season a reality. The Australian violinist Madeleine Easton is an established star on the international stage known for her versatility and expertise in the world of violin playing. Throughout her career, a desire to combine period and modern playing has led to unique opportunities for performing with some of the world’s most respected ensembles and orchestras. She has appeared as concertmaster with the Melbourne Symphony Orchestra, the Gulbenkian Symphony of Lisbon, the Orquesta Sinfonica de Madrid among others. She was appointed concertmaster of the Hanover Band and is now guest leader of the English Baroque Soloists, under the baton of Sir John Eliot Gardiner. She now returns to Australia as founder and artistic director of her own orchestra, ‘Bach Akademie Australia’. Under the patronage of Sir John Eliot Gardiner, Australia now has it’s own dedicated Bach ensemble, presenting the music of J.S Bach at the highest levels of artistic and academic endeavour. Gregg Arthur live in concert with Quartet Quartet, touring throughout regional NSW, featuring orchestrations written especially for Gregg by the late Maestro Tommy Tycho AM MBE.